Artist Amen Ra puts the final touches on the pop-up. Lucy Gellman Photo. A New Haven artist has brought a musical fix to one of New York City’s empty storefronts: a pop-up of his Temple Street nonprofit. Now, he’s watching it catch on a state away. That artist is Adam Christoferson, founder and director of Musical Intervention. Last week, he opened a month-long pop up at 66 Greenwich Ave., in a first-floor space that has been sold, but won’t be occupied until mid-January. While he and Musical Intervention member Amen Ra Ghostra Knowstra man the New York spot through Jan. 13, a team of Musical Intervention regulars are keeping the Temple Street location open. Christoferson: Kindling on the fire. Lucy Gellman Photo. An outgrowth of Christoferson’s work as a recreation therapist at Yale Child Psychiatric Inpatient Hospital, Musical Intervention gives music lessons, songwriting help, and recording space to community members, many of whom are homeless, or in recovery or treatment. 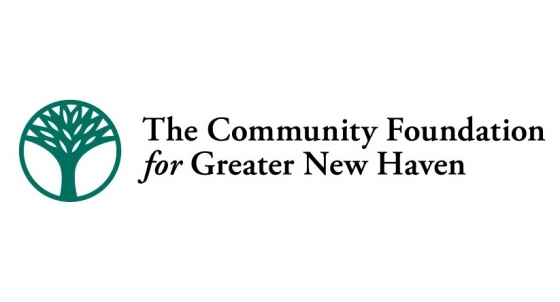 After hosting a concert with Fellowship Place two and a half years ago, the organization has moved into a brick-and-mortar storefront and established new partnerships with clinical and outpatient programs including the Yale School of Medicine and Connecticut Mental Health Center (CMHC). The New York space came to Christoferson through making music. Earlier this year, a family brought their son, Arthur Dodger, into Musical Intervention to check out the space for the first time. It was an open mic night, packed with community members and newcomers, and the family wasn’t quite sure what they’d walked into. Through January, the family has also opened their townhouse to him, so he doesn’t have to make a four-hour round trip on the Metro North each day. But for him, it’s also coming full-circle on a dream he’s had for two decades. Growing up in New Haven’s Cedar Hill neighborhood, Christoferson spent much of his childhood watching patterns of addiction play out at home. He recalled the dissonance of attending black-tie events for his uncle, vocalist Michael Bolton, and then returning home to Section 8 housing that he and his mom shared with cockroaches. He spent time in foster care and special education classes, feeling “academically neglected” as he went through school. Then he had his first exposure to Manhattan. At 13, he began attending “City Kids,” a now-defunct summer program funded through Governor John Rowland’s administration. From a home base on Ella T. Grasso Boulevard, campers would take day trips into New York City, attending museums, discovering new neighborhoods, and spelunking through the city’s green spaces and parks. The display in the front. Lucy Gellman Photo. Greenwich Village was his gateway to the world, he said. After having his mom sign a permission slip “saying I could do whatever” when camp had adjourned for the day, Christoferson spent afternoons winding up Greenwich Avenue, listening for strains of rock and jazz that seeped out of clubs. He fantasized about attending The New School, taking what he’d learned about music making and applying it to his studies. That was 20 years ago. Now a newly minted 34, he said he sees the temporary return to the neighborhood as coming full circle. Around the 800 square foot space, the two have brought reminders of Musical Intervention’s New Haven roots. On the storefront’s broad window, Ra has painted the nonprofit’s signature label, a blue and black musical note. 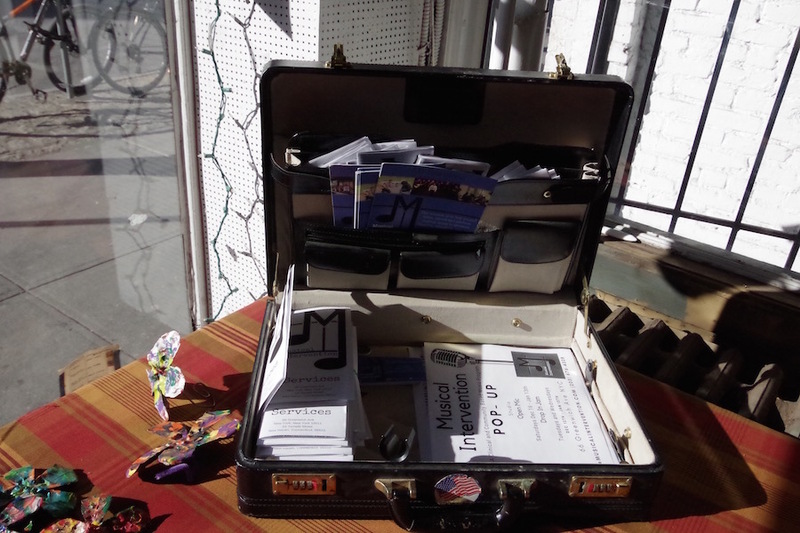 A guitar case filled with CD’s and information sits at the front of the shop. Almost constantly, there are recordings of New Haveners pumping through the space, like F.’s poppy “The Mountain” and “Eyes,” recorded earlier this year at Cedarhurst School. Christoferson said he’s currently in discussions with the state’s Office of Children and Family Services (OCFS) about hosting a showcase. And he’s welcoming drop-ins, like musician Sarah Storm, who came in from the cold on a way to an appointment. Shaking off a “Law & Order: SVU” beanie, she explored the space, eyes slipping over the bright orange rug and equipment as she chatted with Christoferson. “I just think people making music is really powerful,” she said. Outside, a few more parka-clad passers-by stopped to look at the design, and exchange a few words with Ra. Christoferson said that he intends to keep New Haven as Musical Intervention’s home base after the pop-up is over, but is soaking in each moment of his time in the city. He added that it’s a chance for him to think of what he wants to see the group do next. While he said he is committed to keeping the nonprofit in New Haven, he wants to see a little more of New Haven committed to keeping the nonprofit in it.